You are here: Home » GENRE » Fantasy » The Magazine Of Fantasy & Science Fiction, Jul/Aug 2017, Volume 132 #732 (magazine review). The Magazine Of Fantasy & Science Fiction, Jul/Aug 2017, Volume 132 #732 (magazine review). 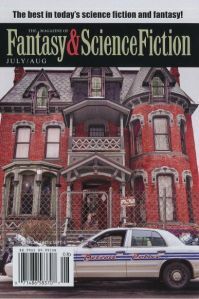 There are nine pieces of prose fiction in this issue of ‘The Magazine Of Fantasy & Science Fiction’: one novella, four novelettes and four short stories. Most are fantasy stories and several of them are from authors new to the magazine. For once, I’m going to go through them in the order they appear, rather than from longest to shortest. We start with the only SF piece, a short story by William Ledbetter called ‘In A Wide Sky, Hidden’. In it, we follow an unnamed male narrator who has spent the last eighty years exploring habitable exo-planets, searching for his older sister who disappeared when he was just twenty. Will he find her before it’s too late? This is an excellent start to the issue, a hard SF story which marries two sympathetic main characters, some fascinating speculations, an engaging quest and some wonderful settings. I thoroughly enjoyed it. Next comes ‘The Masochist’s Assistant’ by Auston Habershaw, a novelette which is set in the same universe as the author’s recent trilogy of fantasy novels, ‘The Saga Of The Redeemed’, but is a free-standing story with new characters. The two main ones are the masochistic magician Hugarth Madswom and his unlucky assistant, Georges. Hugarth spends his days finding exciting new ways for Georges to kill him, so that he can then revive himself from them. Like someone who makes themselves immune to a poison by gradually taking ever larger doses of it, Hugarth is training himself to overcome death. Given this occupation, it is perhaps no surprise to find that the mage has no time for the strict social etiquette of the local aristocracy. A point he makes abundantly clear one morning when he decides to go for a run through the village stark naked! While Hugarth finds this funny, Georges is anything but amused as it is he who has to endure the derision of all the other families’ servants. Is it time to find a different job? I really enjoyed this darkly humorous story while also recognising that, hidden below the fun, is a serious message about living life on your own terms, rather than following the crowd. ‘The Bride In Sea-Green Velvet’ is Robin Furth’s debut story in MoF&SF. However, given that she is the person who recently adapted Stephen King’s ‘Dark Tower’ stories into a series of graphic novels, she must obviously be an experienced and talented writer. That shows immediately in this dark fantasy novelette. Nobleman Sir Henry needs to secure a human sacrifice ahead of his upcoming forty-ninth birthday, as he owes his continued good fortune to the local sea gods. Not particularly wanting to murder any of the local young ladies, though, Sir Henry decides to use a bit of magic instead. Can he get away with it? This is an interesting and extremely well-written story which dragged me along very successfully to an ending I didn’t expect. It’s worth noting, though, that there is some explicit sexual content in the story, in case you share your copies of MoF&SF with younger friends or family. Following this are the issue’s regular two book review columns. Charles de Lint looks at a varied set of eight books and does his usual excellent job of providing thoughtful and sympathetic reviews of each, while Michelle West provides in-depth criticism of three recent fantasy novels. Next comes the issue’s longest story, David Erik Nelson’s dark fantasy novella, ‘There Was A Crooked Man, He Flipped A Crooked House’. This story is also the inspiration for Nicholas Grunas’ photorealistic cover art, illustrating the house of the title. The story itself follows the adventures of Glenn and Lennie, both of whom work for dodgy Detroit-based property developer, Felix Fleischermann. He has bought yet another run-down house in a poor area of the city, hoping to be able to quickly and cheaply do it up, then sell it on for a large profit. However, when Glenn and Lennie turn up to check on the condition of the place, they find it in perfect condition, despite the locality being a dump. Why hasn’t it been vandalised or broken into? There’s clearly something unusual about it, as they find out when they try to get in, without success. Is it just a well-protected house or is something more sinister going on? This story may occupy nearly a quarter of the magazine’s pages but it wears that length easily. Nelson writes in a relaxed style that encourages you to turn the pages and his characters are all worth getting to know. Glenn and Lennie, in particular, present an extremely likeable double act, while the main characters they interact with all come across as solid, believable people. The plot is fascinating and the horror element is well-handled, too, providing a genuine level of dread at times. Following immediately after the lengthiest prose piece comes the shortest. ‘A Dog’s Story’ by legendary writer and editor Gardner Dozois is a brief fantasy which takes us into the mind of a family dog trying to solve a violent crime. I don’t always get on with animal stories but this one works very well. ‘I Am Not I’ is G.V. Anderson’s debut in MoF&SF. This novelette gives us a China Mieville-esque slice of weird fiction about a young woman called Miss Strohm-Waxxog. She lives in a future society where gene-splicing has led to a schism between the dominant Varians, human-animal hybrids, who compete socially for the most ostentatious non-human body adaptations and the underclass of Saps, unaltered humans who have no rights, do all the menial work and live in slums. Miss Strohm-Waxxog comes from one of the richest Varian families but she is estranged from them and has to find herself a job whilst trying to hide the dirty secret that could get her killed. Will she succeed? Anderson has created a comprehensively realised future world which I would love to explore at greater length. She has produced a sympathetic heroine, some wonderfully odd secondary characters and a compelling plot. Hugely enjoyable. Pat Murphy and Paul Doherty’s regular ‘Science’ column deals this month with the complexity of natural ecosystems and the damage that can be caused to them by an excessive faith in the power of technology and illustrated by the plight of bumblebees. They explain the issues well and provide plenty of food for thought. Next comes David J. Skal’s ‘Films’ column. This time, he reviews just a single film, the live action remake of ‘Beauty And The Beast’, starring Emma Watson, otherwise known as Hermione in the ‘Harry Potter’ films. He loved it and explains why in a clear, informative piece. The fourth and final novelette in this issue is ‘Afiya’s Song’ by Justin C. Key. This is an alternate history story set in the plantations of North Carolina in 1821. Afiya is a young slave who has grown up on the Hairston cotton plantation. As a young girl she played with the present owner, newly-married Louis Hairston. Then, as a teenager, she had a child by him. Being a slave, the baby was taken away from her so she could keep working. Like the other slaves, Afiya is regularly whipped for minor infringements of the rules. Unlike the others, however, Afiya can heal her wounds in a few hours by singing to herself the magical songs of her ancestral African gods, taught to her by her mother. When her slave husband, James, gets angry about her latest whipping and spits on the boss, the result is inevitable. To avoid losing face in front of the other slaves, Louis Hairston has to whip James so severely that he dies of his wounds a few hours later. Unsurprisingly, this is a turning point in Afiya’s life and from this moment forwards she decides to teach her fellow slaves her healing songs, as a precursor to rising up against their oppressors. Will the healing and the sense of hope that her songs bring to the other slaves be enough to secure them their freedom? I’m sorry to have to say that I found this story a disappointment. Key is certainly a talented writer with a strong ability to depict the historical setting convincingly and I enjoyed the first part very much. However, by the end of the piece, three things bothered me. I should warn, though, that the points I am about to make include serious plot spoilers, so if you’re planning on reading the story yourself, you may want to skip ahead to the next paragraph now. The first was that Afiya, the lead character, seemed to me to be very flat, with insufficient depiction of her character leaving me less sympathetic to and interested in her than in several of the more minor characters we meet. Second, the magical aspect of the songs she sings does not live up to expectations. While it has an almost miraculous ability to heal Afiya rapidly and completely, its effect on the other slaves is variable, pretty limited and entirely defensive. So the idea that it has a transformative effect on the morale of just about every slave she meets, let alone their eventual ability to bring about the end of slavery in the USA, seems optimistic at best. Third and most seriously, the story is clearly a morality fable, yet some of Afiya’s moral choices towards the end of the story, when planning the proposed uprising against their white oppressors, seem deeply flawed themselves, making it difficult to see Afiya as the clear moral superior in the story. Without that, I was left unable to draw any clear conclusion beyond the obvious and completely redundant one that slavery was a bad thing. I’d hoped for more. Sophie M. White’s short poem ‘Northwest Cruise’ illustrates the emerging reality of climate change in a thoughtful and amusing way. ‘An Obstruction To Delivery’ by Sean Adams is a dryly humorous contemporary dark fantasy about postal workers who are forced, after the antics of one of their former colleagues turns public opinion against them, into delivering the mail via a newly discovered network of caves underneath their city. Unfortunately for them, the caves are already occupied and the existing resident doesn’t take kindly to visitors. The story itself is very enjoyable but what I particularly liked about this piece was the way in which Adams has chosen to tell it, through a series of 31 short narratives in the form of a Q&A, which allows him to comment on the story as he’s telling it. A novel approach, used to great effect here. In ‘An Unearned Death’ by Marissa Lingen, Osrith is a messenger of the gods, a mortal whose job is to tour the countryside, telling anyone who asks her which if any of the gods will be willing to take their soul when they die. This is a big deal because Death quit his job some time back. So those who get to the end of their lives but don’t have a specific heaven to go to are doomed to ‘the boneyards’, where they will continue to exist on the margins of life forevermore. So what should Osrith do when the next person who requests her services is a kind farmer, with a lovely family, except for the one person on whose behalf he is asking for her help, his horrible, selfish, virtueless mother? This is a fine morality tale, raising difficult questions about how we manage our relationships with challenging family members in later life which will, I’m sure, strike a chord with many readers. It certainly did with me. Paul Di Filippo’s ‘Curiosities’ column covers one of the lesser known novels by Robert C. O’Brien, author of ‘Z For Zachariah’ and ‘Mrs Frisby And The Rats Of NIMH’. ‘A Report from Group 17’ is a post-World War Two SF thriller about a Nazi scientist brought over to America to continue his research into mind control technologies. Di Filippo presents a strong case for the novel’s rediscovery. In conclusion, I thoroughly enjoyed this issue of MoF&SF and rated all but one of the nine stories as very good or excellent, making this one of the best issues I’ve read for some time. That rather puts the pressure on the next issue, which marks the magazine’s 68th birthday and includes a rare new story from SF giant Samuel R. Delany. I look forward to seeing if it can keep up the standard. « Blade Runner 2049: official prologue film.